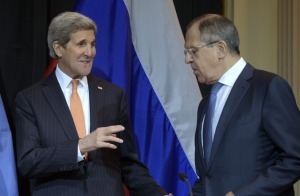 Following the signing of the Syrian ceasefire agreement by the 17-countries International Syria Support Group, (ISSG), U.S. Secretary of State John Kerry announced that time was essential with regard to the implementation of the ceasefire if Syria’s territorial integrity was to be preserved. Syria could indeed fragment, and the United States are not the only player with a Plan B. Others with a Plan B include Russia, Turkey, Israel, and Iran. All members of the ISSG agreed on the implementation of a ceasefire in Syria, to begin next week. The group, jointly chaired by Russia and the USA, also agreed that the ceasefire would not include the self-proclaimed Islamic State (a.k.a. ISIS, ISIL, or Daesh), as well as Jabhat Al-Nusrah and other Al-Qaeda franchises. A coordination hotline is being established at the Hmeinim Air Base from where the Russian Air Force is conducting operations in Syria. The hotline will be operated by Russian military personnel and serve primarily as a means for all of the belligerent parties in Syria to have a contact point to coordinate the ceasefire, to avoid unintended confrontations, and to de-escalate situations in cases where clashes erupt. The Syrian government fully endorses the agreement but stresses that it would not allow terrorists to take strategic or tactical advantage of the ceasefire. U.S. Secretary of State John Kerry briefed the press on the agreement and warned that time was of the essence if the territorial integrity of Syria should be preserved. The statement has been ill received in Russian media. The United States, however, is not the only international or regional player with a Plan B up the sleeve. 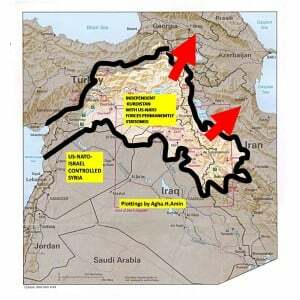 The United States and NATO have long considered the establishment of a so-called Kurdish Corridor (see map) as a prime objective. The plan aims at the fragmentation of Syria, Iraq, and ultimately northern Iran. Military and Security analysts, such as Pakistani Major (r) Agha H. Amin noted that the long-term objective is the establishment of a belt of low-intensity conflicts from the Mediterranean, and along Russia’s soft and resource-rich underbelly to Pakistan and beyond. Hence the deployment of U.S. Special Forces to aid Syrian – Kurdish YPG / PYG fighters. The YPG / PYG is not (yet) officially calling for the establishment of a separate Kurdish State on Syrian territory. The Syrian government has, however, made considerable concessions to the YPG /PYG with regard to regional self-determination. The YPG / PYG is a traditional ally of the Turkish Kurdistan Workers’ Party (PKK), which is designated as a terrorist organization by Turkey, and most NATO member States. NATO member Turkey has been and continues to play along with NATO’s long-term strategy with regard to the Kurdish Corridor in Iraq. Ankara’s and NATO’s overall strategy concur as long as the Kurdish Corridor does not involve Turkish territory or Syrian territory along Turkey’s southern and especially Turkey’s southwestern border. Turkey fears that the establishment of a semi-autonomous or autonomous Syrian – Kurdish region will lead to the destabilization of eastern Turkey and the strengthening of the PKK. Hence Turkey’s recent shelling of Kurdish YPG / PYG positions in Syria and the crackdown against the PKK. Turkey’s Plan B involves the continued support of ISIL and Jabhat Al-Nusrah to eventually pass “Turkmen Rebels” in north-western Syria off as “moderates”. Moscow, aware of NATO’s long-term strategy has supported the PKK since the mid-1980s. The PKK also enjoys the support of Venezuela’s governing PSUV and of Cuba. NATO is neither the first nor the only one to invent or use the principle of “Stay Behind” armies and proxies. Strategists in Moscow have to consider the secular PKK as an asset that can provide a buffer against NATO’s expansion towards Russia in the region. Hence Moscow’s ardent criticism of Turkey’s crackdown against the PKK and the shelling of YPG / PYG positions in Syria. The YPG / PYG is in a position where it can freely negotiate with Damascus, with Moscow, and with Washington. Ironically, Turkey’s NATO partner Washington and Russia may both consider the fragmentation of Turkey as part of a viable Plan B. While the world focuses on the war in Syria and the ISSG, Israel is largely operating under the radar of most international media. Israel has, since 2011, intensified its efforts to de-stabilize Syria by supporting the Free Syrian Army, Jabhat Al-Nusrah and others via the Israeli-occupied Syrian Golan Heights. Israel has for decades declared that it intends to permanently annex the Golan Heights. It has, however, been unable to achieve a concurrent vote of the permanent UN Security Council members to support this illegal annexation. Israel has, illegally, enforced Israeli jurisprudence, Israeli culture, the Israeli language as official language, and Israeli education in the Golan. 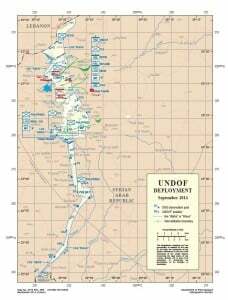 Israel’s cooperation with Jabhat Al-Nusrah and other insurgencies in the Golan has led to the withdrawal of UNDOF forces from a 12 – 16 k-wide corridor in the demilitarized zone. It is here Israeli military and intelligence interact freely with the “rebels”. The strategy has several functions. It displaces Syrians in the Golan by insurgencies with a large percentage of foreign fighters. It challenges Hezbollah and provides Jabhat Al-Nusrah access to Lebanon’s Bekaa valley. At a politically and strategically convenient time, it will provide political cover for the permanent military occupation of the Golan due to the UNDOF’s “failure”, and under the guise of Israel’s “war on terrorism”. All of the above does, of course, motivate Iran to preserve “a Syrian State” and not necessarily “the Syrian State” as we know it today. Every country’s government operates on the basis of the primacy of its own, national security interests. Tehran’s main strategic objective is to maintain a Syrian State and an Iraqi State with governments that secure an Iranian corridor to the Mediterranean. Tehran is also concerned about the possibility of a NATO-dominated Kurdish State in Northern Iraq. Tehran currently attempts to counter the potential threat from a Kurdish corridor by improving relations with Washington and by military operations in Iraq and Syria. Tehran would not necessarily consider a Muslim Brotherhood associated government in Syria that maintains good relations with Tehran and Hezbollah as an existential threat. Tehran’s support of the Egyptian government under Mohamed Morsi and its response to the ouster of Mosi should suffice to explain the point.